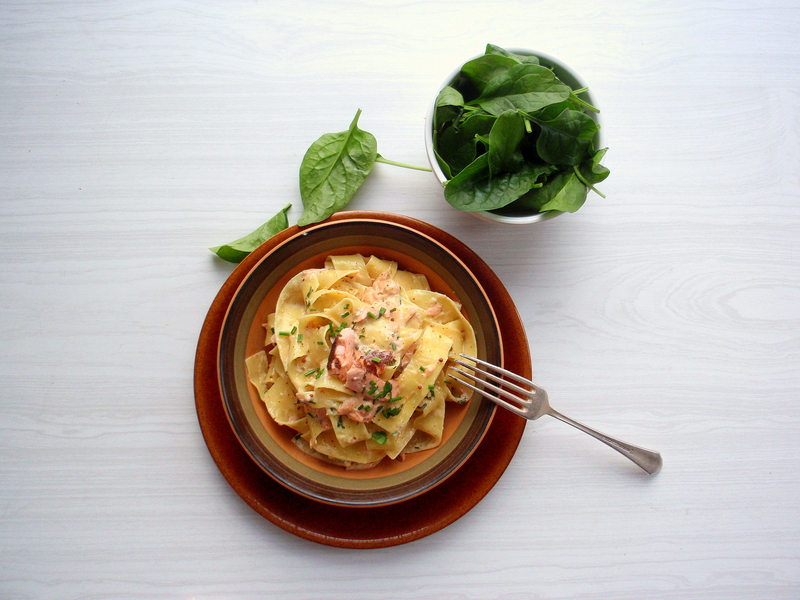 Last week, when I made this pasta, I had just returned from a busy weekend in Auckland: time spent with new friends, a full-on and utterly fantastic Saturday at the (first ever!) New Zealand Food Bloggers’ Conference, a prolonged boozy Sunday brunch (complete with bubbles and strawberries and peonies and asparagus!) in the big, rambling Ponsonby villa of one dear friend, a catch-up with another over some quick oysters at Depot, subsequently nearly missing my flight and then actually nearly missing my flight after I bumped into another friend outside the airport terminal. It was a whirlwind weekend, one that reminded me that people* (both new to me and old) are generally wonderful. That there’s nothing that unites us quite like sharing good food. That I love Auckland. There. I said it. Near-blasphemy coming from someone as stubbornly in love with Wellington as I am, I know. Words I never thought I’d utter but that I’ve slowly been warming to over the last year or so, forming the words silently with my mouth while no one is looking: I actually really love Auckland. Because for me, having grown up in a city where bumper-to-bumper traffic is a fact of daily life, where getting across town to meet up with friends is more than a 10-minute walk, where you plan nights out around taxi rides or sober drivers, the suburban sprawl of Auckland feels perversely comfortable. Maybe even relaxing, in a strange way. When I’m in Auckland I almost think I could live there. I’ll walk through Mt Eden or Ponsonby or Grey Lynn in a little fantasy world – if I lived here, that’d be my favourite cafe, this would be the little shop I’d always pop my nose into on the way home, I’d get all my cookbooks from Cook the Books (if you were at the post-conference dinner last weekend you would too), I’d be friends with this greengrocer and I’d live in this house or that one or one just like it, and it’d be nice, and I’d be happy. I feel a bit unfaithful to Wellington when I’m thinking these thoughts. But deep down I know if I ever leave Wellington it won’t be for Auckland but for somewhere a little less familiar, something that’s as yet unknown. And so I come home. The downside of a weekend fling with Auckland is the exhaustion that follows. Wellington’s so familiar and comfortable; it’s a place I love dearly, but sometimes it feels like I know it just a bit too well. And so coming home feels a bit like waking up from a really good dream, the kind where you want to shut your eyes as hard as possible and will yourself to fall back asleep in the hopes that maybe you’ll fall back into it again. The kind where your head’s in the clouds for a good couple hours in the morning, maybe even until lunchtime, and you need something good to ease yourself out of it. 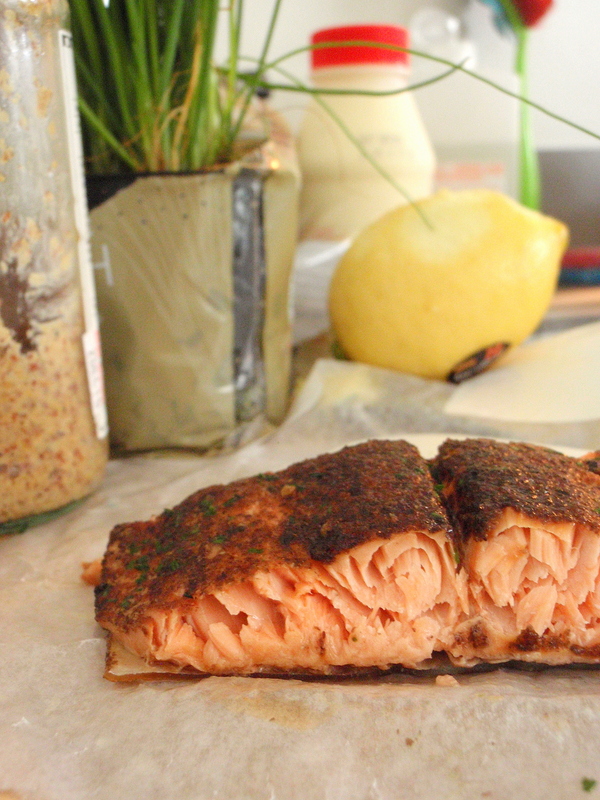 I was also craving something really specific: the karengo hot smoked salmon from Plentifull Deli on Majoribanks St. So on the Monday after Auckland I popped into Plentifull – no salmon. I made do with buying myself some other little treat, and on Tuesday afternoon, I phoned ahead: “hey, do you have any hot smoked salmon today?” “let me check… oh, we’re just smoking some now; it’ll be ready in a couple hours”. And if there’s anything that can pull you out of a dream-like post-holiday daze, it’s the satisfaction of getting exactly what you want. 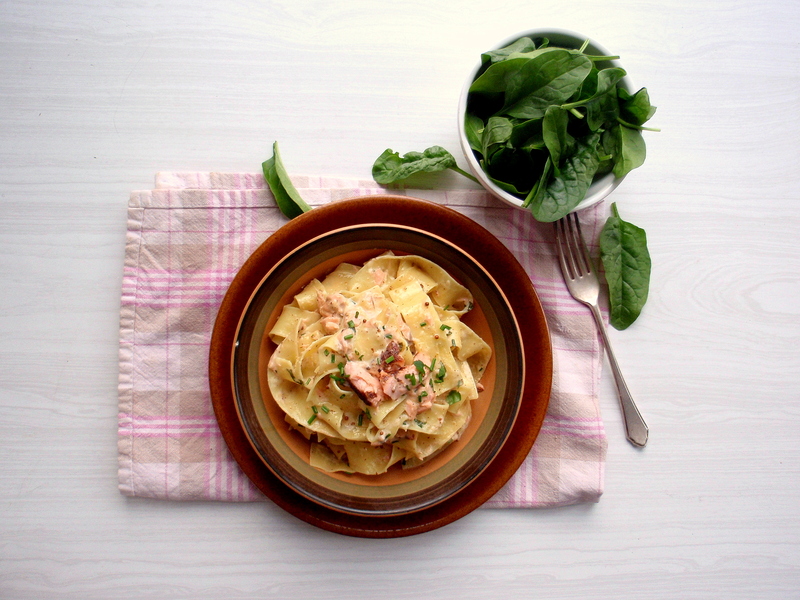 So I practically skipped home after work, a little parcel of fragrant, smoky fish in my handbag (yes, my bag smelled great – albeit fishy – for the next day or so), cooked up a big batch of noodles, and this dish was born. **not really picking on the North Shore here particularly. It was just the first thing I could think of that I had some form of perceived contempt for. I don’t, actually… also, I really think my opinion of Auckland has improved a lot now that there are people there who are lovely to me and drive me places. And thus talk to me during traffic jams in a much better way than, say, a taxi driver/fellow bus passengers could. Thanks, friends! ***from the simplest of leaves dressed only with sea salt and olive oil to more complex combinations of grain and legume and all sorts of good stuff! ****not for long, though – I’m off to Melbourne tomorrow! 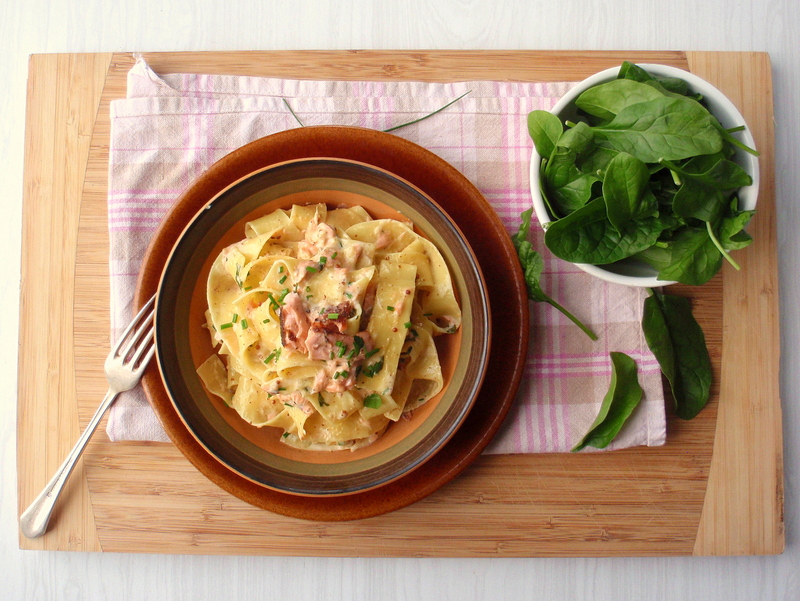 Cook some pappardelle (I used about 100g of this stuff) in well-salted boiling water. Drain, reserving a bit of the pasta water. 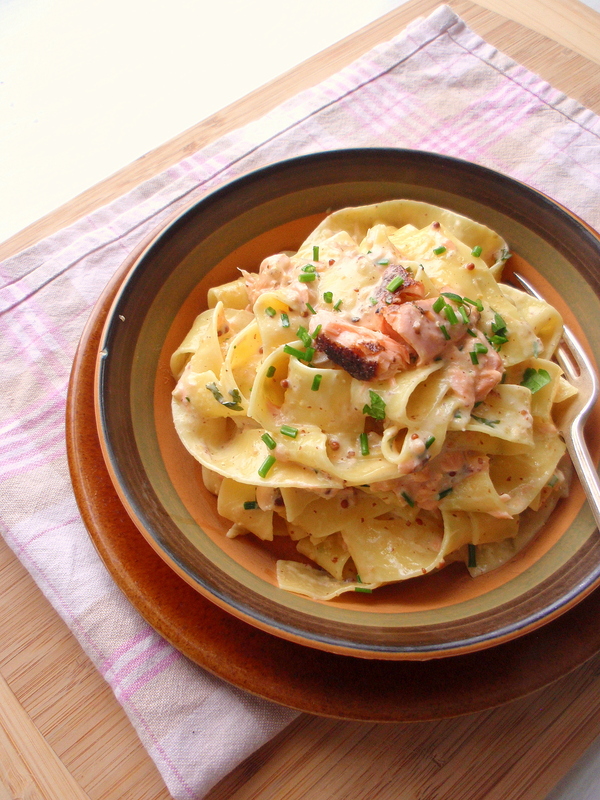 Once the pasta is almost ready, heat up about 1/3 cup creme fraiche and 1/3 cup cream in a wide, shallow pan. Add about a tablespoon each of grainy mustard and lemon zest and stir to combine. Season with salt and pepper if needed. 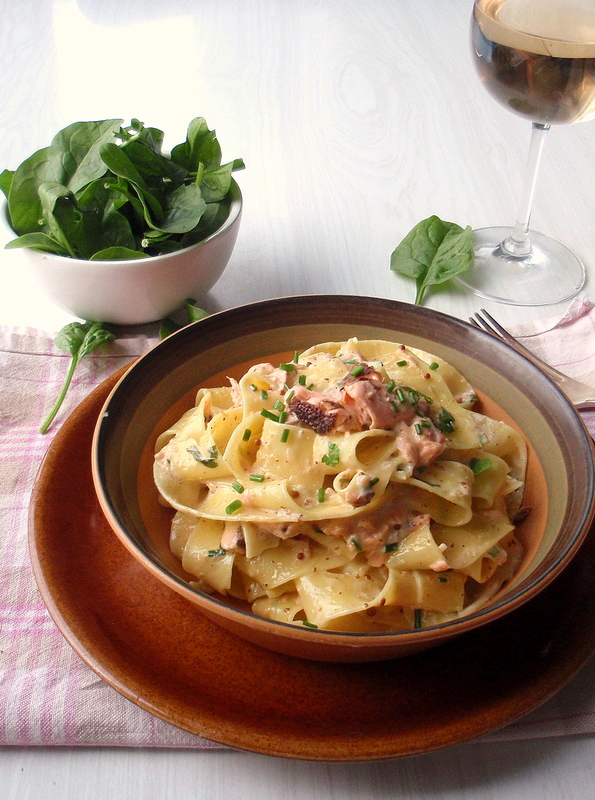 To the sauce, add some flaked hot smoked salmon (I used about 100g, which was perfect) and a tablespoonful of chopped chives. Add the cooked pasta and toss gently until all the noodles are coated in the creamy sauce (use some of the pasta water to thin the sauce if the it’s too thick). 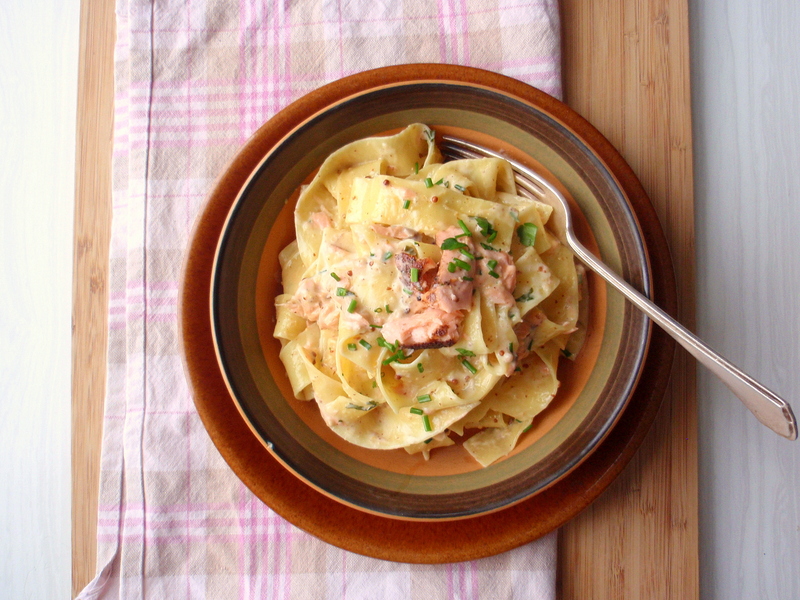 Serve, topped with a little extra salmon and chives to garnish (if you care about things like that). It’s rather predictable, really, but when spring rolls around all I want to eat is salad. There’s something about that raw crunch, the burst of flavour, the pure freshness of it all that’s missing over the long, dark winter stretch of Cooked Food (sure, you can have salad in winter, but is it ever as earnest as all the young leaves of spring?). And I’d be exaggerating if I said everything I ate over winter was a monotonous succession of homogeneously-textured slop, because I certainly ate well throughout the winter months. But I can hardly remember the details of the stews, the soups, casseroles and curries that got me through. I’m too engrossed in trying all the different flavour and texture combinations within the realm of salads. And as far as flavour and texture combinations go, this salad, which I’ve adapted only very slightly (and only to reflect the ingredients I had at hand) from Yotam Ottolenghi’s most excellent cookbook Plenty*, is a winner. Nutty, yielding quinoa. 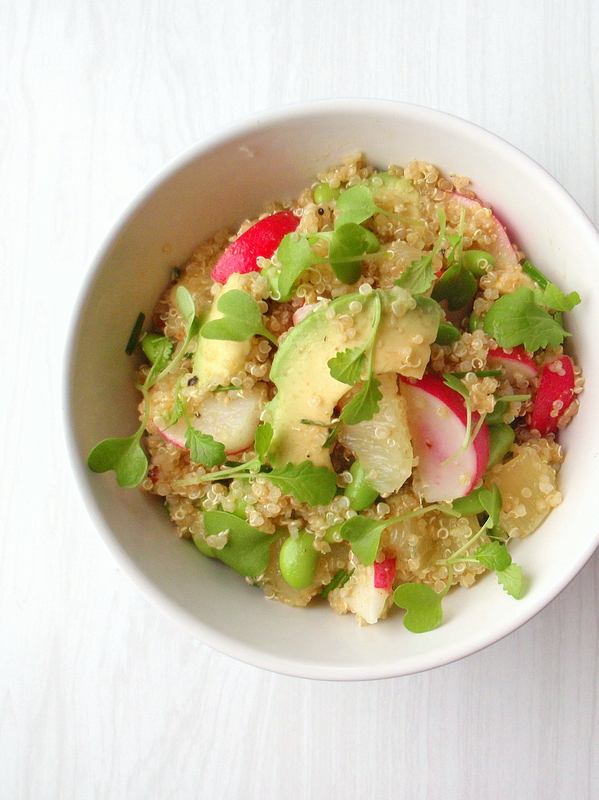 Hot, crunchy radishes. Smooth, mild avocado. Sour, juicy bursts in the form of lemon segments. Edamame adds a bit of nubbly texture and, um, more nutty flavour, and the baby mustard greens I used add just a breath of barely-there heat. So this is a salad I urge you to try. 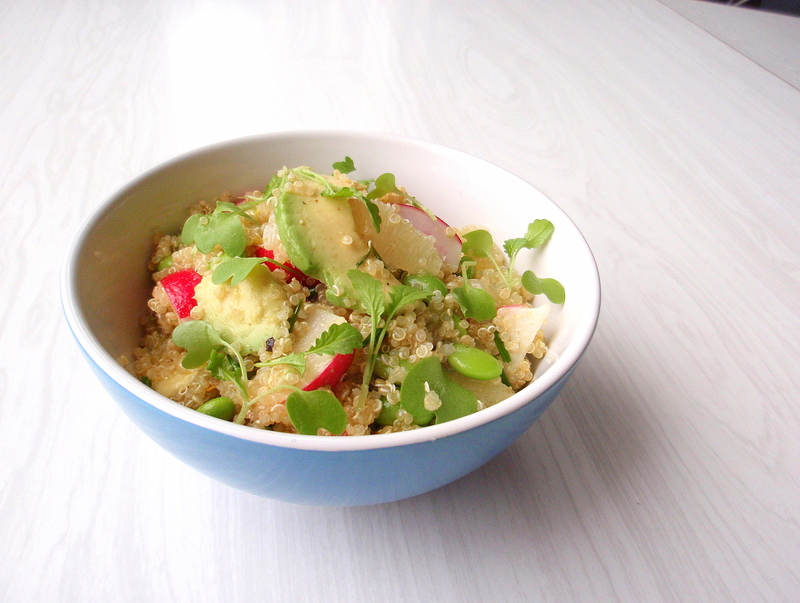 It’s a little bit substantial, too, thanks to the quinoa, avocado and edamame: plenty of good stuff like proteins and amino acids and monounsaturated fats and whatnot. And it’s got that added bonus of being gluten-free, in case you were wondering. But enough of the health benefits. It’s just good, okay? And it tastes just as good, if not better, when you pack it up and eat it for lunch the next day (though I’d recommend letting it reach room temperature before serving). *it really hasn’t taken long for this book to become a favourite. Some nights I go to bed with it, waking up at 2am all confused as to why I’m clutching a hard, rectangular object… sad but true. **cue little shoulder-shrug and cheeky silent excited-smile and resisting the urge to do little handclaps even now, yes, it was that exciting. ***those ones came from the same Wairarapa-dwelling workmate who brought me the bag of Jerusalem artichokes that went into this soup, as well as the freshest eggs I’ve ever tasted. She’s awesome. And the radishes were deliciously hot. ****And now I’m thinking I should end this stream-of-consciousness rant about radishes and get onto posting the recipe. Sorry everyone. I’m very tired and bleary-eyed tonight, and I love radishes. Though maybe not as much as that I-love-cats girl (making the rounds on youtube a wee while ago) loves cats. Serves 2-4, depending on whether you’re eating this as a main course or a side dish, how hungry you are, that sort of thing. 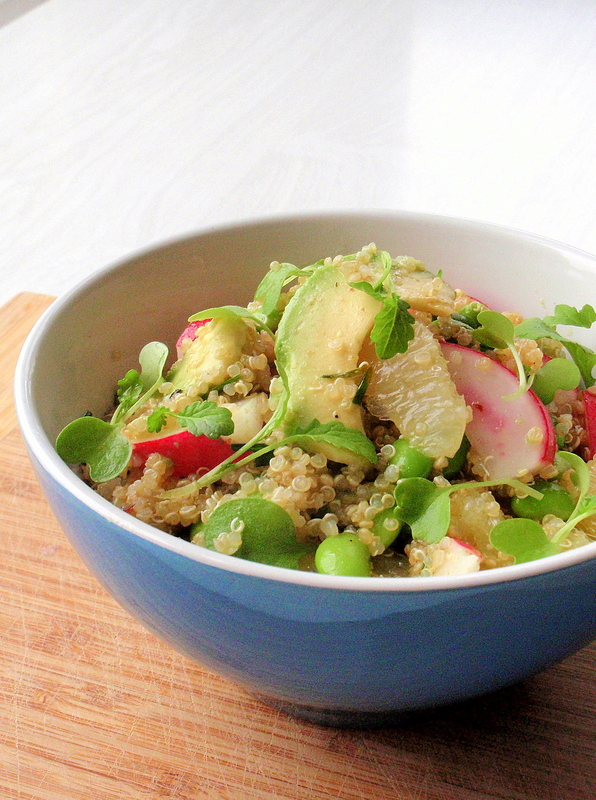 Cook 100g quinoa using your favourite method. Ottolenghi recommends bringing it to a boil in a pan with lots of water, then simmering for 9 minutes, draining, rinsing with cold water and letting it dry. It worked for me. Meanwhile, cook and shell (or defrost, or whatever you need to do) 250g edamame. * Let cool slightly. Slice a lemon into segments by first cutting off both ends, then carefully removing all the skin and outer pith, then slicing between each membrane so you get pretty, jewel-like segments. ** Do this over a bowl to collect the juices and chuck the segments in there as well. Cut a small-to-medium avocado into thin slices and add to the lemon juice. 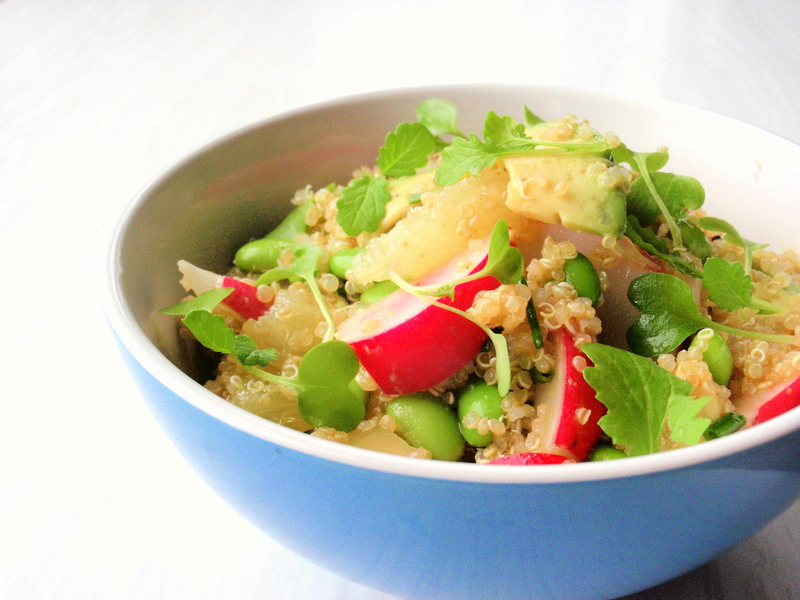 Toss very gently just to coat it with the lemon juice, then add the quinoa, 100g radishes cut into wedges, the edamame, a handful of baby mustard greens***, a clove of crushed garlic, 1/2 tbsp ground cumin, 2-3 tbsp olive oil and a pinch of chilli flakes. Season with flaky sea salt and cracked black pepper and toss with the gentlest touch you can manage. Garnish with some more baby mustard greens. Serve into bowls and eat with all the wide-eyed joy of a child discovering all the different flavours and textures at once. (Okay, maybe a little child would turn its nose up at this salad. But you get the picture). 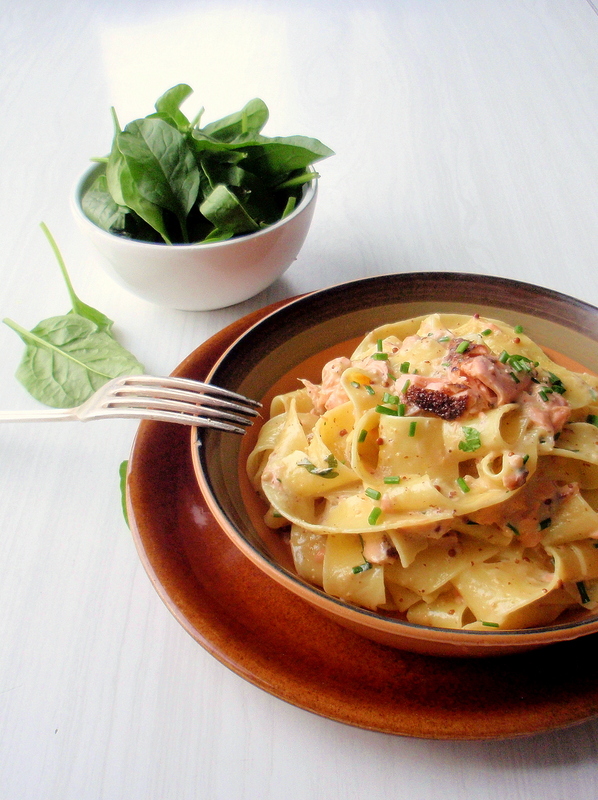 *the original recipe used broad beans. If this is something you have in your garden right now, don’t hold back. USE IT. I just had no broad beans handy, and plenty of edamame in the freezer. **Since first trying this technique when I made this salad (also roughly based on a Plenty recipe) I’ve become more convinced of its utility, despite the extra time. Not only do the citrus pieces look beautiful, they’re also free of the tough membrane you so often find in lemons. 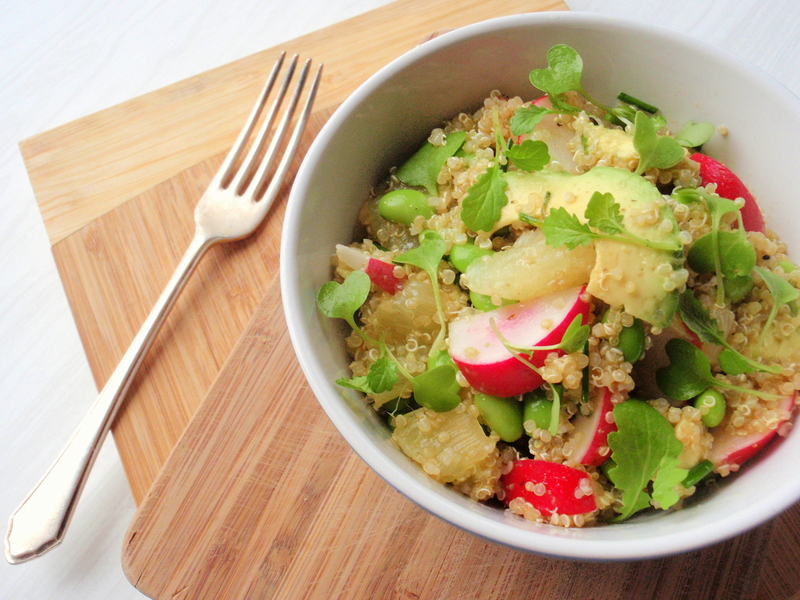 ***I was conveniently needing to thin the pot of mustard greens I’d planted some time prior to making this salad, and was glad, because I had none of the purple radish cress Ottolenghi lists in the recipe. 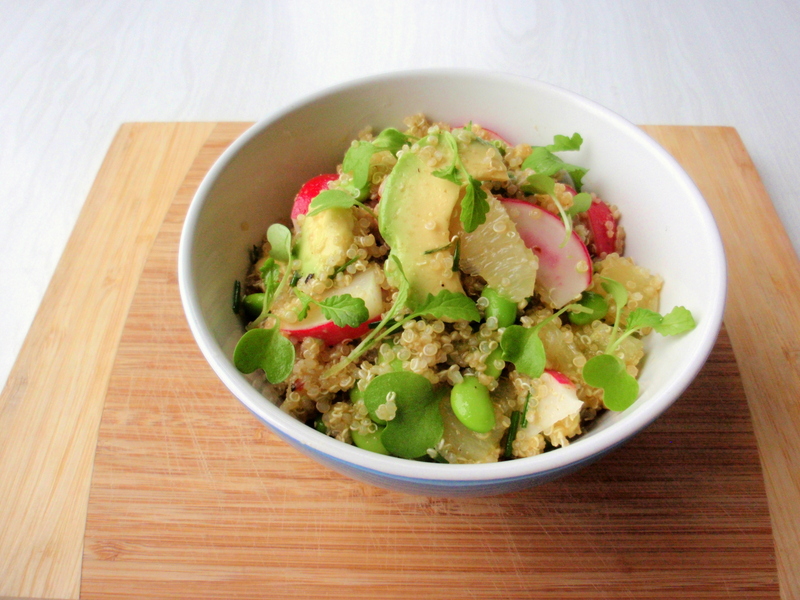 If you have neither baby mustard greens or purple radish cress, don’t let it stop you from making this salad. Bits of peppery rocket would do, or any microgreens or baby greens would work, as would leaving them out altogether. Things have been pretty quiet around here, I know. Somehow I’ve gone from welcoming the gentle glow of vernal sun (and the accompanying bare-legs excitement) to being swept up in the full madwoman whirlwind of spring, that violent spring gale that wrecks all the plants in the garden yet still manages to toss me home at the end of the day*. And now it’s November, and strawberries have come down in price, the days are long and the air is warm. But. I swam in the sea on Saturday (okay, so it was in sunny Gisborne, and the water was still cold, but still), got a sunburn and some deep-crimson cherry tomatoes to match. Despite the frequent moody-teenager squalls that seem to spring upon us without warning, it’s starting to feel like we can almost touch summer. 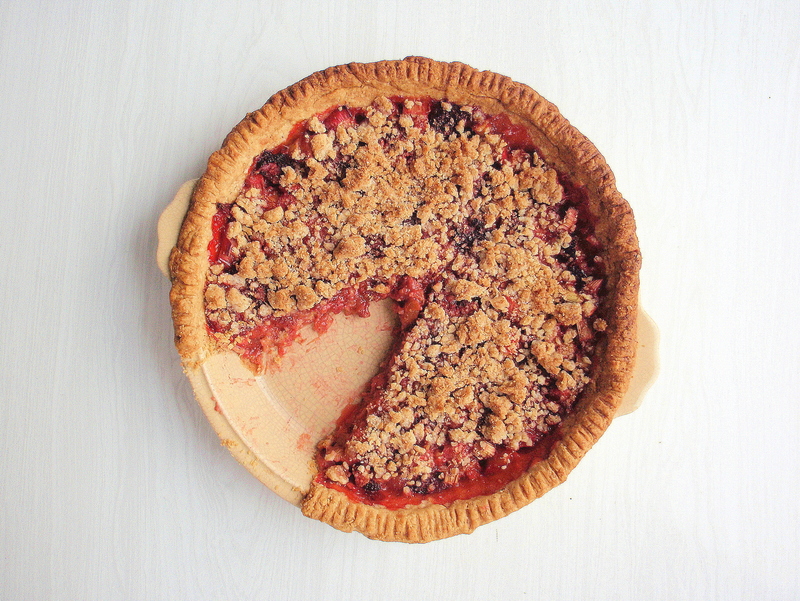 I love pies at any time of year but it’s really late spring and summertime that I love them the best: buttery crusts bursting with the ripe colours and bright juices of berries and stonefruit. And what better way to usher in the pies of summer than with the first fresh fruits of spring? The first time I tasted this strawberry-rhubarb combination was as a kid at some suburban street party or maybe a potluck dinner somewhere in my neighbourhood, in the fading late-evening light at the end of May or early June. 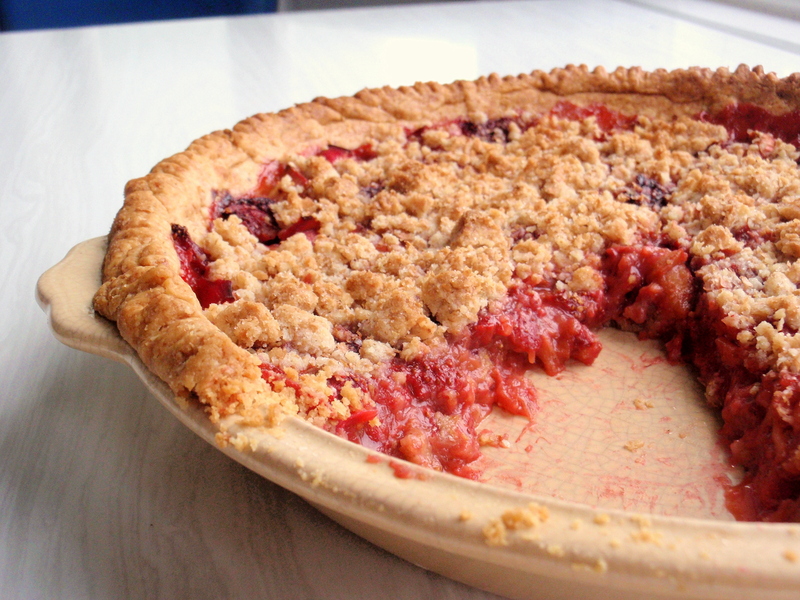 Grass was green and high, fireflies were just about starting to blink, someone was passing around a baking dish full of strawberry-rhubarb crumble. I remember first trying to pick out the rhubarb – unfamiliar to me then, even though it grew in our garden – then eventually realising it all tasted too good to leave behind, scraping the last pink blush of fruit off the paper plate, and seeking out seconds. Too good. 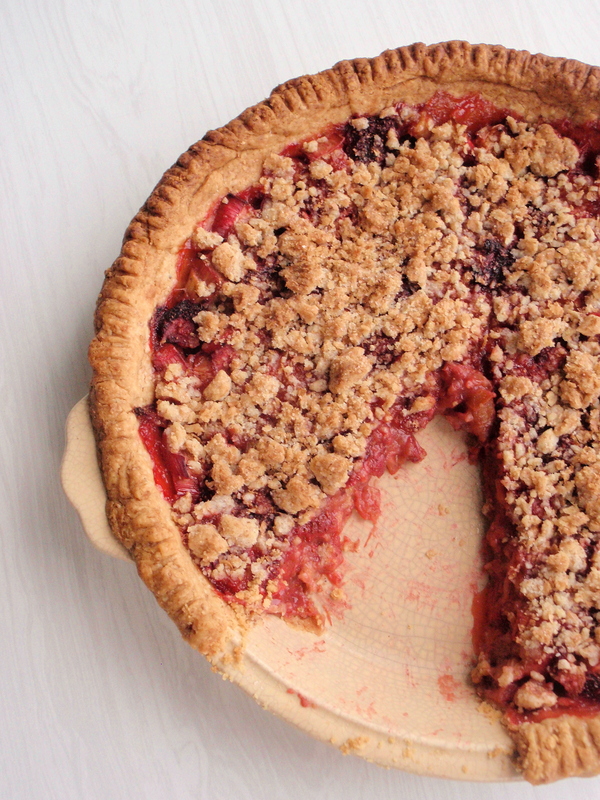 This pie, I guess, is a sort of homage to those long nights of late spring, full of anticipation for the summer ahead. 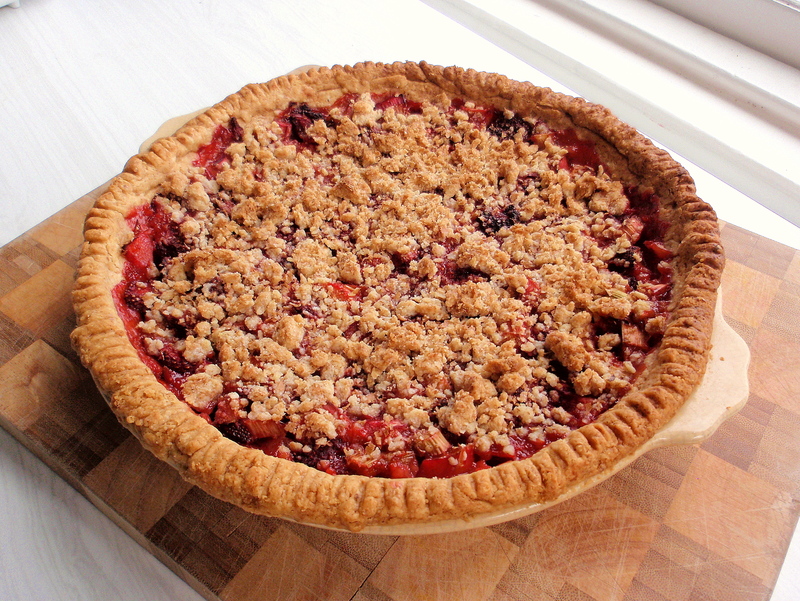 Also I just really like strawberries and rhubarb together, and I really like pies, and my heart goes a little bit fluttery at the mention of crumble topping. *literally – got tossed off my bike today and then nearly swept off my feet. Serious business, this wind. Mix the dry ingredients in a large bowl. Rub in the butter between finger and thumb until it’s mixed into the flour and forms coarse crumbly pea-sized clumps. Sprinkle some of the ice water over the mixture and combine, adding more water or flour as needed until the dough comes together nicely when you try to form it into a ball. Flatten, wrap in plastic wrap, chill for a bit. 30 minutes or so should be good. Roll out the chilled pie-crust dough so that it’s big enough to drape into a pie dish and have little edge pieces flopping over the side. Roll over and pinch together the excess bits of pastry to make a nice crust. If it’s a bit uneven just press it all down with the tines of a fork and call it rustic. Prick some holes in the dough with a fork. Line with baking paper and some dried beans and blind bake for about 10-12 minutes or until it’s just starting to turn golden. Remove and let cool for a few minutes. Using your fingertips or a food processor, mix together 1/2 cup flour, 1/3 cup brown sugar, 60g butter (chopped up into little pieces makes this easier) until the mixture forms coarse crumbs. 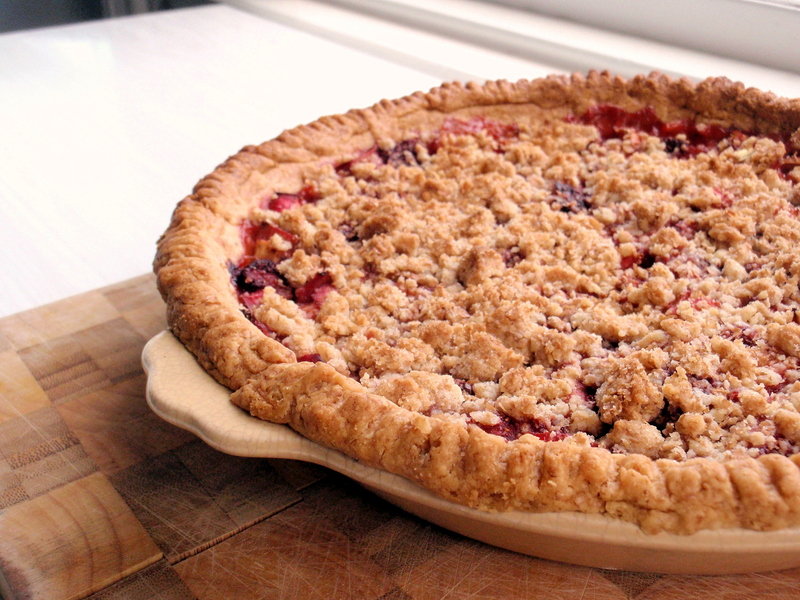 Pour the fruit mixture into the pie shell and top with the crumble topping. Bake for 40-50 minutes or until the fruit mixture is bubbling up beneath the bits of crumble. You may want to check that the crust isn’t burning – if it’s starting to get rather brown, cover with bits of foil. Serve lovingly, with yoghurt, cream or – my favourite – a good-quality vanilla ice cream.